Summary: Following the crop production season in the fall, soil nitrate-nitrogen (N) levels can rise to high levels. Nitrate-N levels in the soil increase due to the incorporation of N-rich crop residues, and, given adequate soil temperatures, mineralization of these residues continues through fall and early winter. The resulting pool of residual soil nitrate-N is vulnerable to leaching by winter rains. Winter-grown cover crops can be used to trap this nitrate in their biomass, however, the economics of vegetable crop production in the coastal production district do not favor the use of cover crops. In Europe researchers have found that applications of high carbon/nitrogen (C:N) organic amendments following crop production can immobilize (tie up) a portion of soil nitrate-N and reduce leaching during winter fallow periods. This occurs because soil microbes utilize available soil carbon for growth, thereby utilizing available soil nitrate-N and keep it from leaching. On the Central Coast, applications of compost in the fall is a common practice used by many growers. We were interested to test if a high C:N compost could be utilized to immobilize soil nitrate-N during the winter fallow. If successful, this could become an economically viable best management practice (BMP) that growers could utilize to help reduce nitrate leaching during the winter fallow. We initiated a trial during the winter of 2016-17 to evaluate the impact of a high C:N compost (31.4) on nitrate-N leaching following a fall broccoli crop. However, no reduction in soil nitrate-N levels were observed following the application of 5 or 10 tons/A of compost. The lack of efficacy may have been due the coarseness of the compost particles which may have been too big to quickly provide soil microbes with sufficient carbon to effectively immobile soil nitrate-N. To address this issue, in the second year of evaluations that are currently underway, we are utilizing finely ground almond shells as the source of the high C:N soil amendment. An economic analysis of the costs of this practice and the impact on net returns is also underway. Background: In the fall, at the end of the crop production season, crop residues are incorporated into the soil and beds are listed ahead of the winter fallow. All cool-season vegetable crop residues are rich in N: spinach contains 30 - 40 lbs N/acre, lettuce and celery 60 - 70 lbs N/acre, and cole crops routinely more than 200 lbs N/acre. Cole crops residues contain more than 2.5% N, which allows for rapid decomposition. As much as 60 to 80% of tissue N mineralizes in the first 4 weeks following incorporation into the soil. The released nitrate-N is vulnerable to leaching loss during the rainy season and poses a risk of municipal drinking water contamination in coastal areas where cool season vegetables are produced. Studies in the European Union (Chaves, et al., 2007; Redmile-Gordon et al., 2014) have shown that application of high-C:N organic amendments can immobilize N mineralized from cole crop residues thereby reducing winter N losses. For the Salinas and Pajaro Valleys, potential high C:N materials that can be used include composts and other organic wastes. During the winter of 2016-17, the first large-scale trial was conducted with a cooperating grower to evaluate the potential of a high C:N compost application to immobilize nitrate mineralized from broccoli crop residue. Methods: The trial was established on a commercial vegetable production field west of Gonzales, CA on a site with Mocho silty clay loam soil. In the 2016 production season romaine lettuce was produced in the spring through early summer and broccoli was grown from mid-summer through fall. The broccoli crop was harvested in October and a biomass evaluation of the N content of the broccoli residues conducted on October 5. The residue was mowed and disced, and the land was prepared for winter beds according to standard practices in the Salinas Valley (discing, ripping down to three feet deep, chiseling and land planing). The preplant fertilizer 6-20-20 was then broadcast at 350 lbs/acre (21 lbs N/acre). On November 14, compost was applied with a commercial spreading truck/applicator at three rates: 0 (control), 5 and 10 tons/acre. Each plot was 20 feet wide (the width of throw of the applicator) by 200 feet long. The plots were arranged in a randomized complete block design with four replications. The compost used for the experiment had a C:N ratio of 31.4 (Table 1). However, the compost appeared to be made from a combination of coarse woody stems and fine dark material. The compost was sieved through a 4.75 mm screen and the fine and coarse materials were analyzed separately, as well as the bulk compost (Table 1). The fine material comprised 35% of the compost and had a C:N ratio of 18.9. The coarse materials had a C:N ratio of 53.8 and comprised 65% of the compost. Following compost application, the field was chiseled and then listed into peaked 80-inch-wide winter beds. 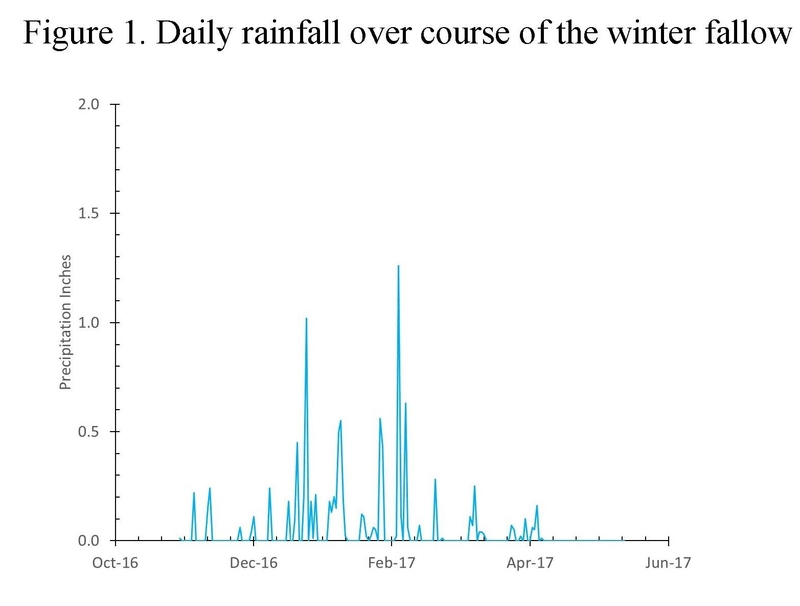 Rainfall totals for winter of 2016-17 were retrieved from the Soledad CIMIS weather station (Figure 1). Soil samples were collected from the top three feet of soil each month from November 2016 to February 2017. Soil samples were extracted with 2M KCl and analyzed for nitrate and ammonium. Following the winter-fallow period, romaine lettuce was planted March 20. Soil samples from the first foot of soil were collected and analyzed for nitrate on March 20, April 6 and May 10, and samples to three feet deep collected on April 20 and at harvest on May 26. Crop biomass and biomass N uptake were measured on April 20. Yield of the romaine lettuce was evaluated on May 25 by harvesting 36 heads per plot for crop biomass and biomass N accumulation. Results: Broccoli residue contained 268 lbs N/acre following harvest in mid-October. It took about one month for the land to be prepared prior to compost application and listing of winter beds. Soil nitrate levels in the first foot was 40 ppm nitrate-N at the beginning of the trial on November 14 (Figure 2). In prior studies, we observed soil temperatures in November and December in the high 40's and low 50's F, which were still warm enough to allow mineralization of crop residues and soil organic matter. That appears to have been the case at this site because nitrate-N levels increased to over 50 ppm in November and December (Figure 2). 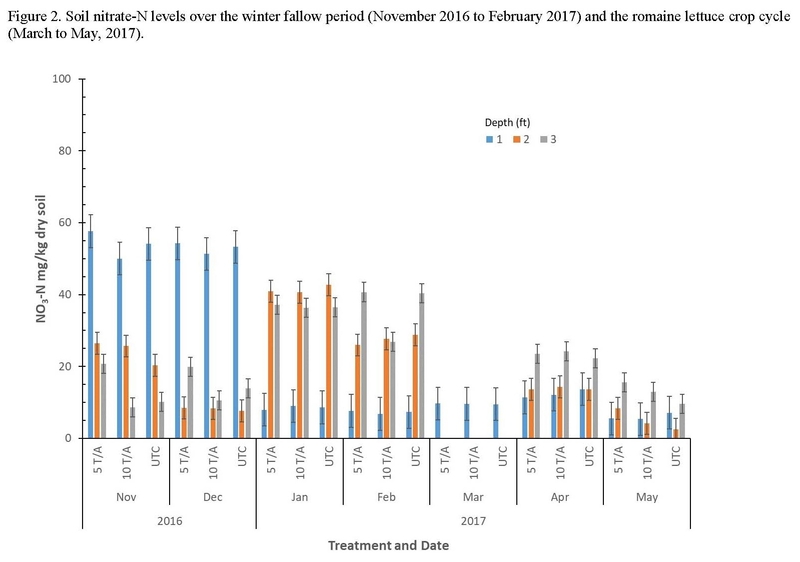 There is a trend in the data indicating a slightly lower level of soil nitrate in the 10 T/A compost treatment in both November and December. By January 26, nitrate-N levels had decreased to less than 10 ppm in all treatments in the first foot of soil. 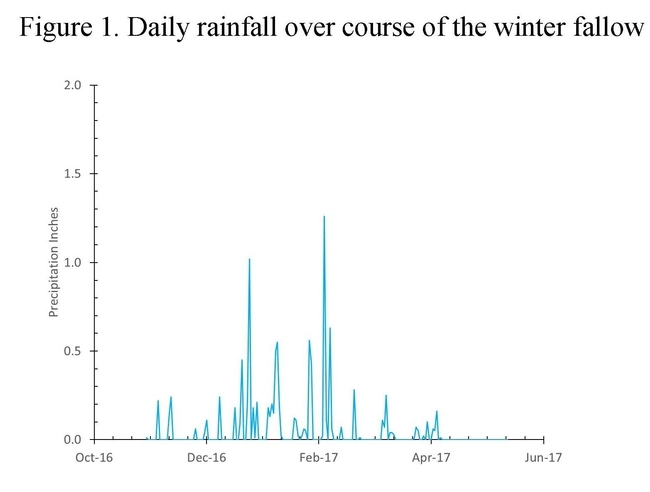 This decrease coincided with significant rainfall events in January (Figure 1). The decline in soil nitrate levels in the first foot of soil coincided with an increase in nitrate-N levels in the second and third foot of soil. There were no significant differences in soil nitrate-N levels among treatments. We hypothesize that the high percentage of coarse material in the compost may not have allowed for soil microbes to effectively utilize and immobilize nitrate-N in the soil. There were no significant differences among in the yield of the subsequent crop of lettuce (Table 2). Chaves, B., De Neve, S., Boeckx, P., Van Cleemput, O., and Hofman, G. (2007). Manipulating nitrogen release from nitrogen-rich crop residues using organic wastes under field conditions. Soil Science Society of America Journal 71, 1240-1250.